Concerned About Finding Inexpensive Wedding Centerpieces? No need to be worried! I have lots of inexpensive ideas to help you. Centerpieces add a touch of beauty and glamor to the reception. They help set the tone for your reception and can be conversation starters and double as centerpieces and favors. Today’s cost conscience brides are hip to the idea of having a magnificent centerpiece without spending a fortune. 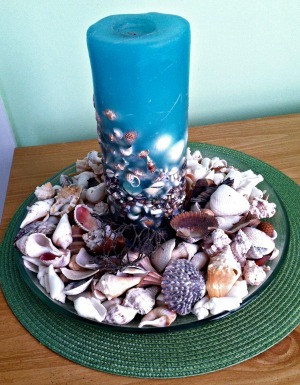 If you are making your own centerpieces, I recommend that you purchase all the items that you will need to make one arrangement and practice putting it together several months in advance of your wedding. Doing this will give you the opportunity to determine how long it will take to assemble, the actual cost of all the needed items, whether it will be easily transportable and if it is exactly what you had in mind. 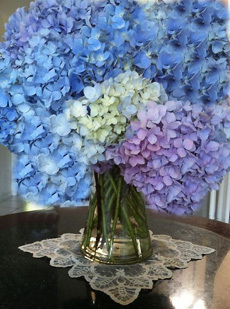 The above centerpiece was created using Blue Hydrangea's from someone's garden. If you and some of your friends have hydrangea plants consider using them to create an inexpensive table arrangement for your wedding. A fall theme wedding lends itself to using nature’s display of vibrant oranges, yellows, browns and maroons. This inexpensive display was created using one candle, leaves from a park and a few small votive candles surrounding the center candle. Purchase a medium sized pumpkin, carve out the seeds, place a little water in the base of the pumpkin and then add fresh flowers. 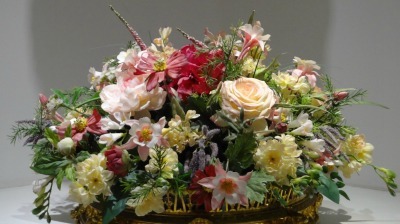 If you prefer dried or silk flowers, leave the water out and place dried or silk flowers in the center. If you have lots of time and people to help you, carve out a face on a pumpkin and place a candle in the center and let the light from the candle help illuminate the room. It’s cold outside but you want your reception room to be warm and inviting. Who doesn’t love the aroma of crisp pine trees? Go for a walk in the woods and cut pine branches, spread them out in the center of your table and scatter pine cones, acorns and artificial snow. 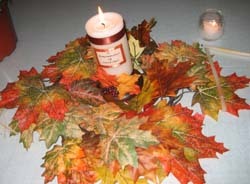 To dress up this centerpiece you can add a few votive candles or one large candle in the center of the arrangement. 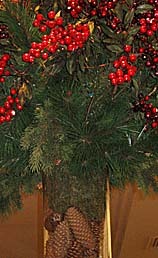 Create your own winter scene by purchasing a clear large bowl, place the bowl on top of a mirror. Fill the bowl about half way with batting and create a winter scene by putting a few skaters and other little figurines on top of the batting. You can put candles and other winter items around the bowl to create the winter scene that coordinates with your overall wedding theme. The cold, dreary short winter days have passed and now nature's trees, plants, flowers and your new life as a couple are beginning. I’m thinking, soft pastels and lots of fresh posies. Purchase an inexpensive vase at a dollar or craft store and fill the vase with flowers from your garden, a wholesale florist or the supermarket. To further enhance your table arrangements, place your vase on a lace doily or scatter colored glass chips, purchased at the dollar store, around the base of your vase. Here we are, the hottest time of the year and your goal is to remain cool and carefree. 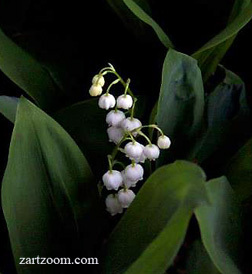 So what says summer more than, Lily of the Valley flowers, which can be placed in short thin vases of different heights to create a soft, inexpensive table arrangement? 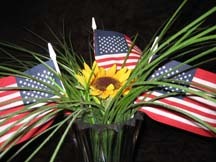 If your wedding is around the 4th of July, consider placing a large sunflower in a vase and then add three small flags around the sunflower. This centerpiece says, "cute and sassy." How about purchasing a clear glass container and filling the jar with seashells collected from the beach or purchased at a craft store. Purchase a tall clear vase and place pine cones, gathered from your backyard or park, in the base and then fill the top with berry and pine branches. My ideas for inexpensive wedding centerpieces will help you plan and get you on the right track for creating fabulous table arrangements without costing you a fortune. Can't find what you are looking for? Check out my home page.